Several families moved on Thursday into homes in the Shiloach Village (Silwan) that belonged to the old Yemenite Jewish community. Several Jewish families on Thursday moved into homes in the Shiloach Village (Silwan). The homes belong to the Beit Rachel complex, which was part of the “Yemenite Hekdesh” community buildings owned by the old Yemenite community of Jerusalem. The six apartments were purchased from the Arab families who had taken over the property after the War of Liberation, when the area was occupied by Jordan until the 1967 Six Day War. The buildings were constructed in 1882, when the neighborhood was an exclusively Jewish one. The Yemenite community was one of many Jewish communities to have a presence in the neighborhood, with its own synagogue and institutions. At its peak 144-150 Yemenite Jewish families were living in the thriving and successful Yemenite Village on the slopes of Mount Zion overlooking the City of David, the Shiloach springs, the Temple Mount and the Old City. Many of the Jews of the neighborhood, including the Yemenite Jews, were forced from the area after the Arab riots of 1929. Less than a decade later, the last 35-40 families were evacuated by British forces, as a fresh round of Arab rioting broke out. The families were promised that they could return to their homes when the situation calmed down, but this was never fulfilled - resulting in the long occupation of Jewish homes by Arabs who claimed them for themselves. The group that moved in Thursday was sponsored by Ateret Cohanim, the Old City yeshiva and institution that has made it a priority to redeem Jewish property held by Arabs. The first group of Jews moved into the Yemenite quarter of the Village in 2004. According to Ateret Cohanim, the sales have been ratified by Israeli courts, and there is no dispute that the apartments are owned outright by Jews. 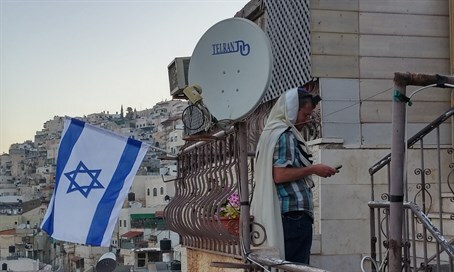 “It is our hope that Jews and Arabs will be able to live side by side with each other in peace and coexistence, as can be seen when Arabs legally move into predominantly Jewish neighborhoods like Pisgat Ze'ev, Ramat Eshkol, French Hill, Armon HaNetziv,” Ateret Cohanim said in a statement.